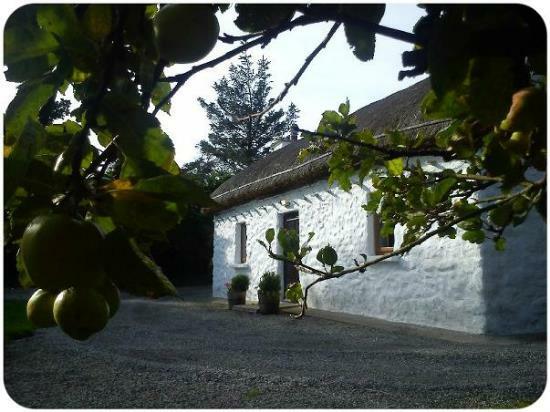 Situated on Loughros Point in Ardara on the south west coast of Donegal, Teach Ceann Tuí (pronounced 'choh kee-un tee', Irish for thatched cottage) is a family run thatched bed and breakfast with a difference. As the guest you will have exclusive use of the one hundred year old thatched cottage (sleeps maximum of four) with a cosy, stylish sitting room and a shower room. Plus use of the large secluded garden. The locally sourced breakfast is made from the best possible produce, including eggs from our own free range chickens and can be taken in the family kitchen or in your private sitting room. On this website you can get more details about the accommodation under About Us, see photos of the cottage and garden, ask us questions using the Contact Us form or even check availability and request a booking directly online. We hope you'll be tempted to come and stay.